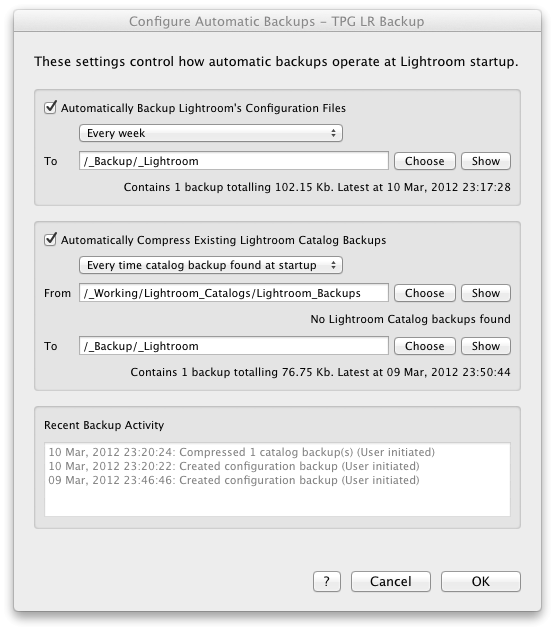 The LR Backup plugin simplifies backing up your Lightroom environment. It does this by adding the ability to backup Lightroom&apos;s configuration files, schedule a Lightroom catalog backup for next shutdown (LR4 only), and compress Lightroom&apos;s catalog backups from within Lightroom itself. These tasks can occur automatically as the program starts or manually as required. Suggestions for using these capabilities can be found here. Lightroom&apos;s configuration is stored in numerous files scattered around your hard drive. The configuration backup collates the various preference, preset, template, camera profile, lens profile, Camera Raw and other setting files used by Lightroom into a single compressed backup file. This can help you quickly find and restore your preferred Lightroom configuration when your system crashes, Lightroom preferences become corrupted, or you wish to move Lightroom to a different system. While Lightroom already includes the capability to backup your catalog the resulting files can be quite large and quickly consume your available disk space. Fortunately these backups compress well, frequently reducing to 10% of their former size when zipped. The catalog backup compression feature helps you automate this process and conserve space for your image files or more frequent backups to further reduce the risk of lost work. The offer to backup at next shutdown feature (LR4 only) also helps conserve your disk space, by allowing you to request backups only when you need them rather then scheduling them overly frequently to minimise risk. Automatic backup tasks are performed in the background as Lightroom starts. Regularity can be independently managed for each backup task so it is a simple matter to compress each catalog backup immediately at startup yet only backup your configuration once a week. The plugin is compatible with Lightroom 2 and above. The trial version does not execute automatic backup tasks at Lightroom startup and instead displays a notice to indicate when an automatic backup would have occurred. Donating to the plugin will give you a registration code that will remove this notice. All future updates are free.